Marc Becnel (BS Physics '10) is already putting the masters' degree in aerospace engineering he earned from the University of Alabama at Huntsville (UAH) in December 2013 to work. He, and brothers Eric and Daniel (BA History '03), founded RadioBros, a pico-satellite (miniature satellites) services firm supporting the aerospace industry. 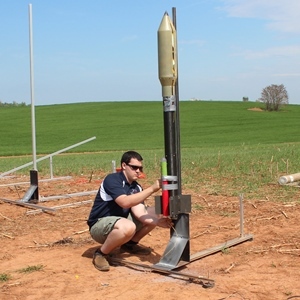 And he has great experience to build from: in his last semester at Huntsville, Becnel and twin brother Eric were part of a team of students accepted by NASA to have their mini satellite, or CubeSat, launched into Low Earth Orbit with the objective of improving communications, altitude control and solar power collection. The brothers see a niche in the evolving cubesat market and RadioBros will be on the ground floor. The company, based in Huntsville, Alabama, produces hardware and software, testing services and support to scientists and researchers in the field.